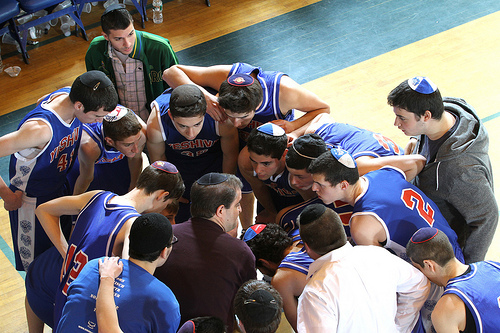 Yeshiva University’s 21st Annual Red Sarachek Invitational Basketball Tournament tips off Thursday, March 22 at 10 a.m. at the Max Stern Athletic Center on YU’s Wilf Campus. The tournament, named after revered former Maccabees coach Bernard “Red” Sarachek, features 20 Jewish high school basketball teams in a dramatic five-day tournament before live crowds and broadcast audiences in the thousands. This year’s field includes schools from across the U.S. and Canada: Bnei Akiva Schools – Or Chaim (Toronto, ON); Columbus Torah Academy (Columbus, OH); Cooper Yeshiva (Memphis, TN); Frisch School (Paramus, NJ); Fuchs Mizrachi School (Beachwood, OH); Hebrew Academy High School (Montreal, QC); Houston Bnei Akiva (Houston, TX); Jewish Educational Center/RTMA (Elizabeth, NJ); Maimonides School (Brookline, MA); North Shore Hebrew Academy (Great Neck, NY); Samuel Scheck Hillel School (North Miami Beach, FL); SAR (Riverdale, NY); Shalhevet High School (Los Angeles, CA); Torah Academy of Bergen County (Teaneck, NJ); Weinbaum Yeshiva High School (Boca Raton, FL); Yavneh Academy (Dallas, TX); Yeshiva Atlanta (Atlanta, GA); Yeshiva of Virginia (Richmond, VA); YULA High School for Boys (Los Angeles, CA); and Yeshiva University High School for Boys/Marsha Stern Talmudical Academy (New York, NY). The Annual Sarachek Tournament runs from March 22 - 26. Complete coverage of the tournament, including live play-by-play broadcasts, as well as updated scores, statistics, game summaries and pictures will be provided by MacsLive. For the first time in its history, all of the coverage of the Sarachek Tournament will be broadcast live in high-definition video to fans around the world. This broadcast is made possible with the support of Yeshiva University’s Office of Undergraduate Admissions and the Center for the Jewish Future. Fans can also follow the action on Twitter using the hashtag #sarachek2012.